Max Johnson skates in with the puck against Alaska-Anchorage earlier this season. 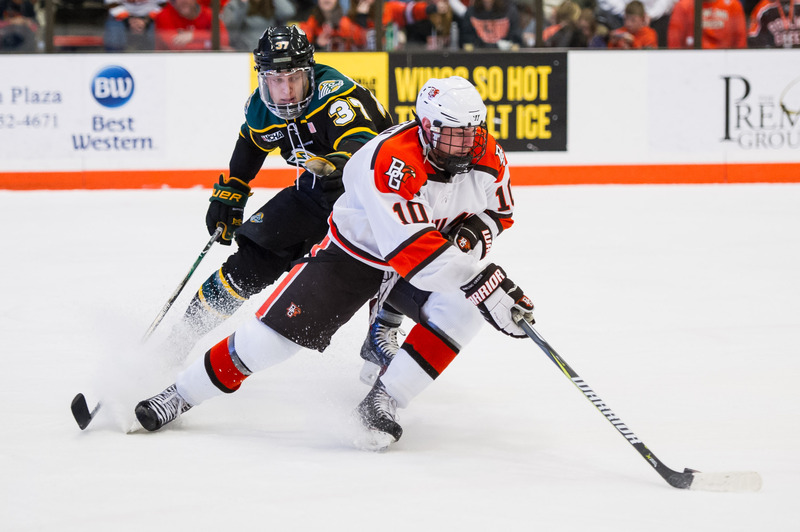 Johnson had the Falcons' lone goal Friday against Northern Michigan (Photo by Todd Pavlack/BGSUHockey.com). Marquette, MI – The 17th-ranked Falcons were unable to quell the offensive wave of Northern Michigan Friday, as they fell 6-1 in game one of the WCHA Playoffs semifinals Friday. Ryan Bednard started in net for Bowling Green and had 23 stops on 29 chances. Atte Tolvanen countered for Northern Michigan and had 19 saves on 20 Falcon shots. The Falcons opened scoring just 1:49 into the opening period on the power play. Stephen Baylis found Max Johnson who forced a shot on net. The puck hit Tolvanen but had just enough momentum to cross the goal line for Johnson’s 12th goal of the season. Alec Rauhauser had the second assist on the play. Troy Loggins tied the game at 14:30 after scoring a one-timer in the waning moments of a Wildcat power-play chance. Northern Michigan finished the first period with 11 shots on net, while Bowling Green had seven chances. The Wildcats took their first lead at 2:20 of the second period on the power play. Robbie Payne was the goal scorer as Bednard was screened by a Falcon on the shot. Northern Michigan added to their lead with goals at 9:17 (Beaulieu) and 9:44 (Paskaruk) to extend the Wildcats’ lead to 4-1. The Wildcats had nine shots in the middle frame while the Falcons had seven opportunities. 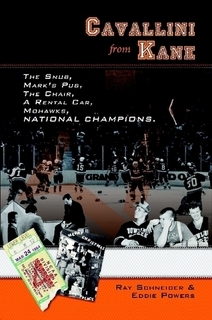 Northern Michigan added a fifth goal at 10:28 of the final period when Mitchel Slattery finished a two-on-one breakaway. The Wildcats capped scoring at 16:55 when Robbie Payne finished a two-on-none breakaway to push the lead to 6-1 and the eventual win. Bowling Green managed just six shots in the final period while Northern Michigan had nine chances. With the loss, Bowling Green’s record falls to 22-11-6, 17-6-5-2. Northern Michigan improves to 24-13-3, 19-7-2-2. The Falcons must win Saturday’s game (7:07 ET) to keep their season alive and force a game three.